This page created on Notepad by Ian Smith, August 1997, updated 1st December 2000. Almost the end: MBA601 on Red Arrow duties at Gillingham Street garage (GM), Victoria, 17th May 1981. Click image for a much wider view. It was 1964. 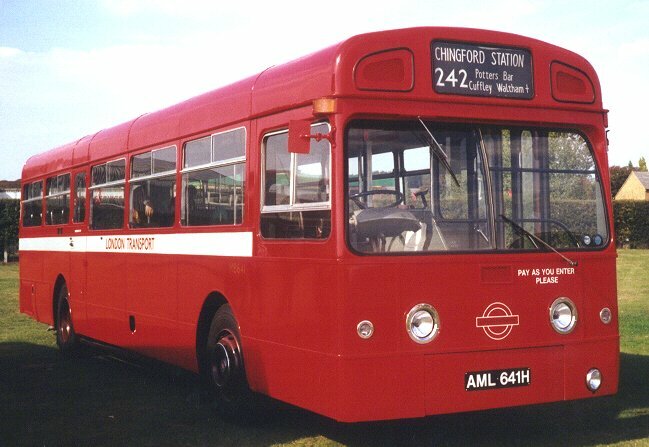 London Transport had a need for a major bus replacement, after years of dealing with a few standard types for its main bus business. The RT and RF were coming to the end of their normal life-span (it was thought), having spent twenty years busily running around the capital. What was to replace them? RM's had replaced the RTWs and most of the RTLs, and had made inroads into the ranks of RTs, but a major factor in the design choice was LT's difficulty in recruiting and retaining staff - in particular conductors (it wasn't easy to live on a conductor's income in London). The West Indies as a recruiting ground, so fruitful in the fifties, was yielding a smaller input, as the stories of real life in London filtered back. The way forward seemed to be one-man-operation (OMO), but that posed its own problems. The idea of double-deck OMO buses was not yet accepted (or legal), but single deckers did not have the capacity to replace double deckers. Or did they? A really long single decker, out to the legal limit of 36 ft, was 20% longer than an RF. RFs seated 41, so at the same seating density this would only yield 50 passengers: not yet equal to an RT's 56. But the RF's small doorways would severely restrict a bus of 50 seats: larger doorways were needed - giving fewer seats. So the simple single-decker was not a replacement for the RT. Someone suggested the idea of standee buses, as widely used in other European cities. A significant part of the bus would be devoted to a standing area, with plenty of grab rails and poles, while a small section could have normal seating. After all, in the rush hour people always had been prepared to stand in the gangways of RTs and RFs, impeding circulation at bus-stops. Outside rush hours the seated capacity would be enough for normal loads.(ho-ho!). With 25 seats and capacity for 48 standing passengers, this bus would really be a crowd - shifter. (I bet the designer never went to work in one every day). MB641 in preservation, at Showbus97, showing the single door of this final batch. Also, with a standee bus, a second door, for exitting passengers, would not be at the expense of capacity. This would leave the front door available for loading. Passengers who needed to see the operator could use the front-most door, whilst those with the correct money could use the parallel entrance and an automatic fare collection machine (AFC). For the standee area a low centre of gravity was essential : ie a low floor. This meant an underfloor mid-engine, so successful in the RF, was not suitable. A rear engine was indicated. This technology too was now becoming available, after the early years of the Atlantean and Fleetline. So the whole scene led, perhaps inexorably, to the design solution of the day: the rear-engined, dual doored, one-man-operated standee high-capacity 36 ft single decker, with AFC. MB 641 in preservation, with a single door. At Showbus 97. Photos by Ian Smith, Click on images for larger versions. No-one can say that London Transport rushed pell-mell into the Merlin programme. Well, actually, many DO say that, but LT had two years of experience with up to fifteen prototypes before the production buses arrived. The trouble was that the prototype experience was limited to one task - that which they were good at - as we shall see. The AEC Merlin chassis (now called Swift by everyone but LT) received bodies by Strachan, who had built bodies for London before (STs in the 1930s). They were well-built, and stylish in the contemporary fashion, with more than a nod to the fashionable BET bus style. 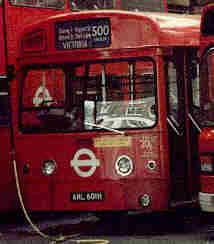 One London feature was the split windscreen, with the driver's half angled back to avoid reflections from the interior. Six (XMS1-6) were ordered for the Central area, for a new venture at a West End express service. This, the Red Arrow, would provide a peak-hour express service between Victoria Station and Marble Arch, with a Victoria - west End shoppers service during the day. These buses had a rear emergency exit window, that did nothing to improve the rear elevation. Inside was the unconventional part: although there were twenty-five seats in the raised rear section, behind the central exit door, the forward part held no passenger seats at all. Entrance was via a pair of turnstiles between the front wheelarches. They went into service from Gillingham Street garage (GM) on 18th April 1966, and flourished. Meanwhile, the Country Area had also received its share. 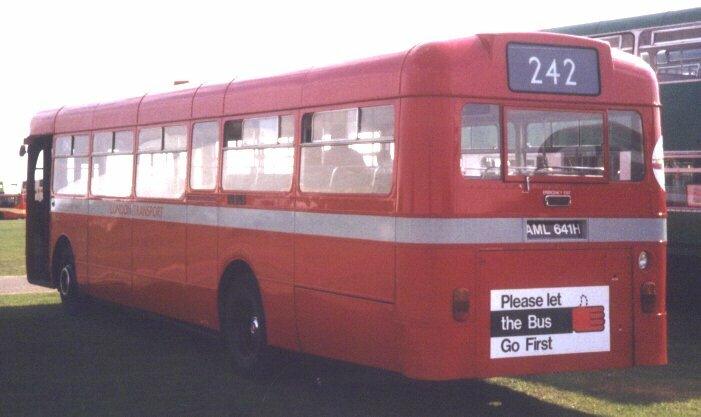 Nine conventionally seated buses (XMB), rather than standees (XMS), were delivered to LT in early 1966. They were basically similar to the XMS buses, but had forty six seats and no turnstiles, being intended for normal driver-conducted one man operation. They managed without the rear window emergency exit, too. They were green of course, but sported a canary yellow waist-band. They ran into Trade Union opposition, as not being covered by the current one man operation agreement. They could not be used. They had been intended for routes 427, 437 and 456, all worked by Addlestone (WY), but instead went into store, either at Reigate or Addlestone. Several were used as trainers, but nothing developed. By the end of the year it had been decided to transfer eight of the nine to Red Arrow duties. XMB2-9 were downseated, equipped with turnstiles and rear exit, repainted and renumbered as XMS 7-14 to help out on the successful Red Arrow routes. They trickled off to Victoria during the first few months of 1967, although because there was now a surplus two of them (XMS11 and XMS13) spent a year on training duties or in store, not entering service until the spring of 1968. Meanwhile XMB1 remained in the Country Area, although it was renumbered in November 1966 to XMB15, to give a single Merlin number sequence. It pottered about, being used for training at Reigate and Garston, or on route surveys (to gauge the suitability of routes for the wider, longer buses). 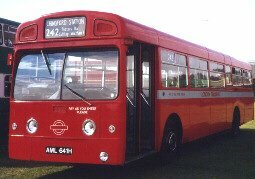 It was reregistered twice (January and August 1967) and finally went into service in February 1969 on the 378 (Tring - Albury), where it pottered about until 1973, when London Country swapped it for MB4 (once XMS4). The production Merlins started to appear in October 1967, although it would be four months before any entered service, and eleven months before most of them earned their keep. They were a smoothed version of the prototypes. Metro-Cammell-Weymann (MCW), builders of the RF, built these buses too. The corners of the prototypes had been gentled out, and the split flat windscreens disappeared in favour of a large barrel-section screen intended to achieve the same effect more decorously. They were very handsome buses. They came in several forms, according to function, Area and age. The younger ones , from MBA 166 onwards had a higher driving position, the earlier low position not having found favour with drivers who expected to be able to look over other traffic AND see the nearside kerb. Red Arrows had front entrance, centre exit, twin turnstiles, 25 seats at the back and room for 48 standing. Blinds were blue express backgrounds with white lettering. Buses wore Red Arrow fleetnames. MBA 16-31 had low driving positions. MBA 166-193 had high positions. Central MBS had front entrance, centre exit, twin turnstiles, 25 seats at the back and room for 48 standing (initially). They wore red and white, and soon acquired coin in the slot symbols on the front. Some later buses had nearside turnstiles only, the front half of the doorway offering driver-transactions. They wore green and canary yellow, with only discrete signs on the front to show the Autofare requirement. Central Area buses had a single doorway at the front, for entry and exit. They packed in 50 seats. Country buses had dual doorways, with 45 seats, 25 in the raised rear section and 20 in the front. They were green, naturally.